‘It is obvious that Liz Cochrane is an outstanding artist in reviewing her body of work. As a former student, I enjoyed her teaching style and personality even more than her expertise. She is an elegant woman, yet very down-to-earth and uses the legendary English wit to its fullest. She is very easy to spend time with, an interesting conversationalist and helpful in all things involved in the art experience. I recommend her highly. ‘Dear Liz, I just had to write and tell you again how much I enjoyed taking your painting classes in Montisi. I had never painted before but the idea of a painting class in Tuscany sounded like an experience not to pass up. I never thought I would come home with anything. Especially two completed paintings! In two days! I framed them and hung them on the wall as soon as I got home. I am so proud of them and I can’t believe I painted them! They are the best souvenir I have ever brought home from a trip. I smile and remember an amazing week in Montisi everytime I look at them. Painting in your courtyard was a highlight of my trip to Italy and I dream of coming back and doing it again someday soon. Thank you for my art lesson. My picture looks brilliant and I loved creating it . You taught me things I could never do and you made learning fun. You are an amazing teacher and I would be extremely happy to do it again.your studio was a cool place to go to. To send Elizabeth a new Testimonial that can be used on this page – please use the form below. we spent a lovely morning learning to paint a watercolor with liz. as beginners both, we were appreciative of her patient instruction and confidence in our ability to turn out a piece of art -which we did! we found our time relaxing and satisfying. 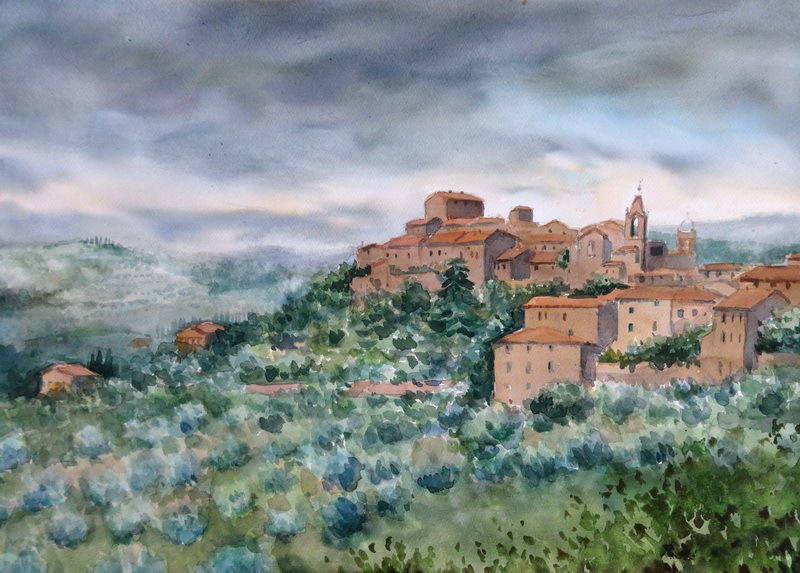 and- our paintings will serve as a delightful memory of our time in Tuscany. thanks, liz! we will be back.